May not overwinter but spectacular even if only for one season. Late blooms are loved by butterflies. Give it lots of room as it is actually a bush. Okay, I admit that I've never seen any claims that this plant is hardy in Minnesota. I have, however, overwintered it here and I have seen it featured in Minnesota Horticulture. And, even if it doesn't make it through the winter, the show that one can get in a single season is well worth the try. True to its name, this is a spectacular butterfly plant and wonderfully fragrant as well. The lavender flower clusters appear from mid- to late summer and continue until frost. They are somewhat reminiscent of lilac blooms. 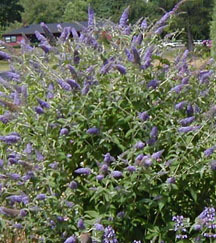 If you try Butterfly Bush, be sure to give it plenty of room. It is actually a shrub and can reach 6 feet with a 3 foot spread in a single season. It does well on my somewhat lean and droughty soil. If attempting to overwinter, I suggest not cutting back in the fall; this will help to hold an insulating snow cover. New growth is very late to show in the spring. It comes on old wood but only at the very base of the plant in our climate. The plants that I sell are seed propagated.